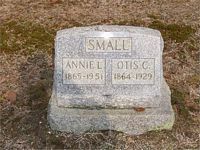 Annie Louise was born on July 9th, 1865 in Pennsylivania. Annie Louise's father was Robert Gephart and her mother was Maria Anne Louise Bohnert. Her paternal grandparents were Richard Geppert and Louise Gepert; her maternal grandparents were Jakob Bohnert and Waldburga Metzinger. She had seven brothers named Edward, Charles, William, Joseph, Robert, Henry and Arthur. She died at the age of 85 on March 26th, 1951 in New Jersey.